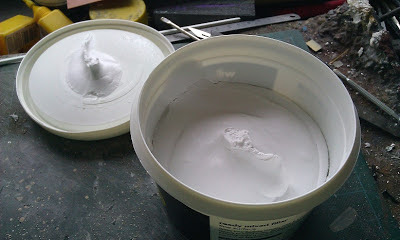 For small scenic work such as dioramas, I'm a big fan of ready mixed wall filler. It's reasonably clean to use as you don't end up splashing water and powder around at the mixing stage. An old credit card or one of the free advertising cards Lovefilm insist on sending me works as a spreader. While I wouldn't try to cover a large area in the stuff - far too stingy for that - for the sort of work I do at the moment it's idea. Even for a layout, I'd keep a pot handy for patching and bodging. Anyway, I open a new tub from Wilko and what do I find? Air. I mean, there the right weight of filler (I check on the scales) but the amount of notfiller is disconcerting. Sometimes items are supplied in tubs/boxes/containers that are slightly larger than the actual contents as when filled, they may fill a larger area but once the content has settled it can reduce in size. Does this make sense? Actually, no. The filler is squirted in the tub as a liquid. It might settle a little but not this much. I suspect there is a standard pack size for normal and my preferred, finescale filler. The later is denser than the former, hence the air. Not to worry. It's cheap (£2.90 for 600g) and does the job. Half of it will probably go off before I use it anyway. Half an hours leisurly soldering and I have a Thornycroft van chassis. All the bits fit together OK. There wasn't any flash to clean off. Not much detail either if I'm honest, but no one will notice on the layout. 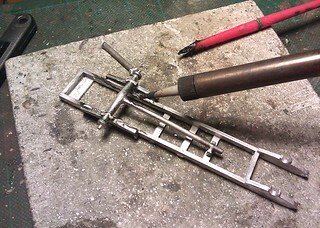 Right, before I crack on with the Thornycroft, a quick lesson on soldering whitemetal. Low-melt soldering scares the heck out of people. The concept of poking hot soldering irons into a material with a low melting point is scary. Magazine articles frequently mention kits being reduced to puddles when the author wants to explain why they are using glue, or just wishes to embue his text with an air of machismo. There is one thing to remember: low-melt solder melts at a lower temperature than the castings you are soldering together. Thus, your iron can be set at a temperature low enough to let you poke a casting with it but still hot enough to make molten solder. You'll need a temperature controlled iron of course. Mine cost me a tenner from Maplin although it's normally 20 quid. The pointy bit it came fitted with was replaced with one of their spares (costing half as much as the iron!) and all is well. Dial the temperature in to about a third of the range, let it warm up and then poke the back of a casting with it. If nothing bad happens then the iron is cool enough. Then poke the solder. If this melts you're good to go. If not tweak up or down until you find the happy temperature. Talking of solder, I buy mine in big bags from Langly Models. They will sell you flux too but I prefer Powerflow from the DIY store. Admitedly 'cos it lives on the bench but since it works, then this is good too. Apart from that, low-melt soldering is the same as the higher temp stuff. Put the bits together, smear flux over the joint, pick up solder from the end of the stick and work it into the joint with the iron. Blow on the join to cool it off and you're good. Low melt does take longer to cool to hard than hig temp. Someone who does physics can explain that perhaps. Not so scary after all. Very small castings can absorb less heat than bigger ones so be careful poking them with a hot iron. You will read people soldering low-melt with normal irons. It can work if you are confident, quick and work with big lumps of metal. Get a temperature controlled iron and don't be silly. A quick project. That's what this will be. Clayhanger Yard needs road transport. Road transport suitable for a layout set between the wars. Not an era well supported in the RTR diecast world who prefer the post WW2 period as more potential buyers might remember the prototypes. 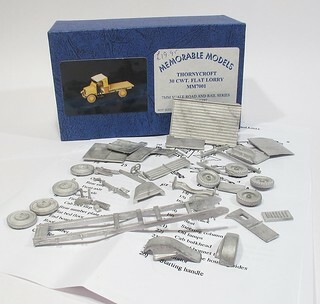 Anyway, in the back of the cupboard is this Memorable Models whitmetal kit for the Thornycroft 30cwt flatbed. Just what I need. Now, I don't know much about lorries so I've been digging around on the web to find out more. I think this is a JJ type first produced in 1927. The cab design would certainly mark it out as a very early vehicle. 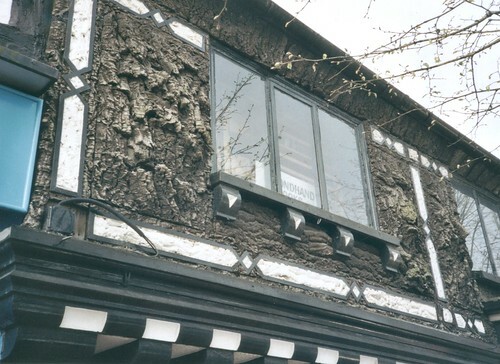 I found this fantastic history on the Hampshire Museums website. If I'm right then it's just what I need to stand by the goods shed awaiting a load. The good thing about the inter-war period is that we didn't worry about MOTs or anything like that. Car brakes were pretty hopeless anyway but mostly speeds were low so it didn't matter. If you were the owner of a sporty number of course, you had to learn to drive it properly since there weren't any of those namby-pamby seatbelts, airbags or crumple zones so you either got it right or paid the price. All of this means that vehicles hung around a lot longer than they do now, so as long as my van was built before the layout is set, it's appropriate. Sorted. 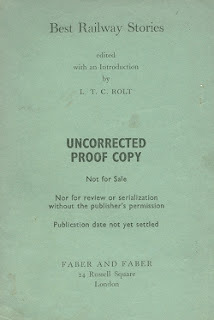 Edited by LTC Rolt, this volume contains 16 stories with a railway theme. I wouldn't get that excited about it normally. You've probably read Dickens ghost story "The Signalman" and several of the others. The star however, is the final tale. Mrs Union Station by Douglas Welch, written in 1937. As far as I know, it's the only fiction where the whole story revolves around railway modelling. If there are others, I don't know of them. Anyway, it's dated, set in America but still funny. You don't even have to read it yourself as I found a radio version from KBOO community radio here. If you prefer a crackly radio play version from the 1940s, Readers Digest present it here. So, get a mug of tea and perhaps a choccie biscuit, settle back for half an hour and enjoy. As you know, I write a lot for modelmaking magazines. Part of the work involves taking photos of projects as I build them. The background to these pictures varies based on the mag the piece is due to appear in. The problem is that the colour can confuse the metering on my camera. So in an effort to get a handle on this, I've tested three different background with two cameras to see what happens. In all the shots, the left hand is a Cannon G12, the right, a Fuji S9500. All I've done is crop and re-size the images. Normally, I'll fiddle with the settings to get the best result but I was interested to see how they looked un-tweaked. Paler colours seem to confuse the camera a lot less than the electric blue so whites and creams are better reproduced. I suspect that the G12 metering needs practise since the background colours are spot-on but at the cost of the colours of the photo subjects. The older camera fades the background but seems happier with the foreground. This is probably be nearly 9000 photos in, I'm more comfortable with it than my newer toy. I am sure I prefer pale background. The trend in publishing is towards more cut-out photos with no background at all to let the designer do their thang. White backgrounds make the cutting out process a lot quicker and easier. Scroll down to picture #16, the Polish rail yard. Might be a fascinating thing to model, with no operating problems! What a picture! OK, so it's been a bit over-processed but it's still fascinating. All those trains. All that infrastructure. Just abandoned to nature. According to Wikipedia, "Częstochowa is a major railroad hub, located at the intersection of two important lines - west-east (from Lubliniec to Kielce) and north-south (from Warsaw to Katowice). Also, an additional northbound line stems from Częstochowa, which goes to Chorzew Siemkowice, where it joins the Polish Coal Trunk-Line. There are six railway stations in the city, the biggest ones being Częstochowa Osobowa and Częstochowa Stradom." So it might be that the photo has had a bucket load of virtual static grass applied to it. Despite this, it is a haunting image which explains it's appearance all over the Interweb. The question is, why are scenes of dereliction and decay so much more appealing, especially to model makers, than those of new, neat and tidy railways? Last weekend, I bought some juggling clubs. Nothing special about this except that the transaction took place in a field at the Leamington Peace Festival. And I paid with a debit card. 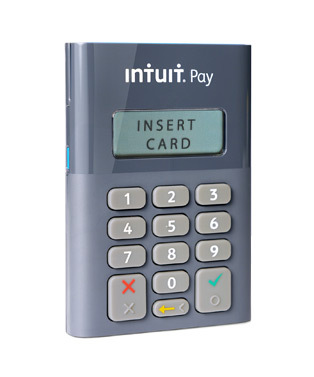 The vendor was able to take payment using a clever device that "talked" to a smartphone. By the time I'd returned home on the bus, a receipt was in my In-box. What has this to do with toy trains? Well, most clubs run a second hand stall at exhibitions and most punters would prefer to pay for their goodies by card. If payment must be with cash then the sale will be lower. When it's possible to bash the plastic, temptation can run wild and the second hand stall profit rocket. Same deal with traders. I know many take cards but not all. The thing is, that the price on this gizmo seems within reach of many clubs. At the time of writing 50 quid plus 2.75% of all sales. While there will be some members who whine about the later, it's a fee for a service provided. Downsides - the sale took 5 minutes so you'd be wary of using it on a busy door for ticket sales. Receipts are electronic so a book to write them in for those who need paper. I've no connection with the company, it just seemed a bit nifty and might solve a problem for someone. I've always been fascinated by the Advanced Passenger Train. BRs attempt to leap into the future with a train that could tilt was all the rage when I was a kid. It was clever - tilting the coaches as you go around a corner allows for higher speeds without all that pesky track relaying that we tend to be a bit rubbish at. There were all sorts of novel features such as special brakes, shared bogies and other cool stuff. The prototype (technically first prototype, the one that ran were also designated APT-P) looked like something out of Thunderbirds and was powered by gas turbines. The someone decided that on the first runs you should fill the train with journalists who had been given access to a free bar. Most of them were filing, "I vomited my innards when I rode the tilting train." before they had left the station. Starting the service during the winter when trains aren't at their most reliable was a master stoke too. Of course whichever piss-poor incompetent government we had at the time panicked and cancelled the project. Anyway, the thing got cancelled and I never had a ride. As a result, I'm a bit of a collector of APT memorabilia. Pride of place has to go to 2 (yes 2) wooden APTs intended for travel agents in the days when you might book a train ticket through one. Both came from the antiques centre in Wolverhampton and involved a fast walk to a cashpoint followed by carrying the thing back on a train. It doesn't matter. One day I will place them back to back to replicate the real train with its central power cars. Oh, and both are in better condition than the one in the NRM. Of course, I have a Hornby model. They aren't rare, despite what eBay sellers might try and tell you. 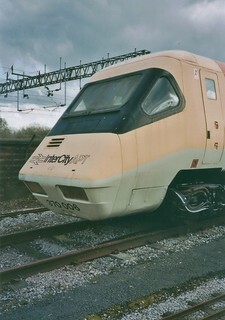 Actually there are two of those as well 'cos there is a plan to re-wheel and detail a set up to modern(ish) standards. 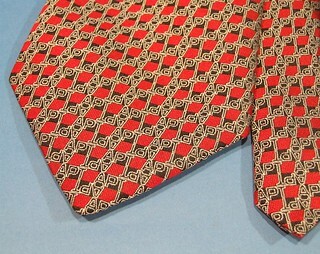 Talking of collectors, from the much missed Collectors Corner at Euston, I acquired loads of leaflets and booklets as well as this lovely tie which I wear to all my unsuccessful job interviews. 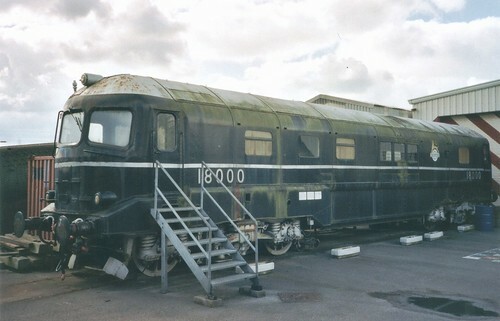 The GWR Brown Boveri gas turbine locomotive was never a glittering success but despite being unique and abandoned in 1960, the beast still survives. Mind you, it's more luck than judgement with travels around Europe and conversion into an experimental tool included in the escapade. I took this photo at Crewe in March 2004 when the loco was in pretty good shape even if the bodysides were turning a fetching shade of GWR green! Here's an oddball building material - bark. I've never seen it used before as building decoration but this is a real shop in a high street somewhere in the south of England. Sadly, it's an old photo and I can't identify the location any more accurately than this. And how would you model it? I'm not really supposed to have this. It's intended for US distribution, not UK. Who cares. I've got it and want to flaunt it. The Bachmann US catalogue, or should that be catalog, tells a very interesting story about how the company sees their market. I'm going to say from the outset that I think they are right, or at least if they are wrong then they will be the ones who suffer. Bachmann have looked hard at the market and what it tells them is that toys sell. 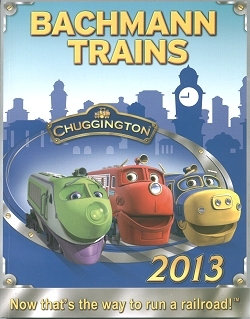 That's why we have Chugginton on the cover and first 5 pages. Then there is a Barnum & Bailey train set (which I covet) before we move on to Thomas the Tank (Bachmann have the rights to this in the US, Hornby in the UK),. In fact its page 18 before we see what you might term a "serious" railway model with the first of the proper train set. Moving on to locos, what struck me is the sheer number of identical models in different colours. American railroads got into standardisation far faster and more effectively than UK ones so you an EMD GP9 can run in 12 different lines livery. US modellers also buy unnumbered and lettered engines. The GE 70-ton diesel can be bought ibn black, green, red and yellow liveries ready for you to add letters and numbers. 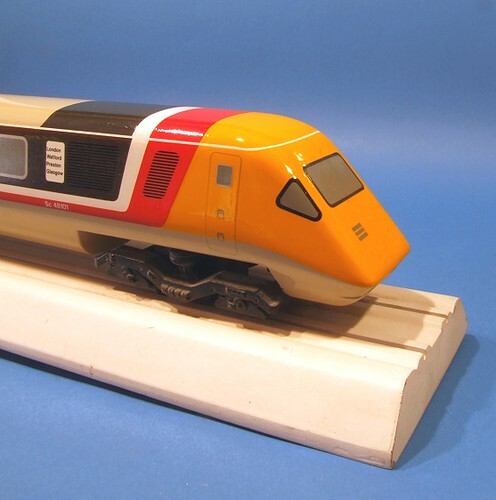 Occasionally UK modellers ask for this sort of thing but mostly they whine they shouldn't have to do any work on a model as it falls out of the box. Re-numbering is certainly a no-no in some quarters although the proponents seem as keen on people doing it as those who are against. Talking of paint, one thing I don't see is factory weathered stock. Maybe Americans like their trains clean, or are just happier making them dirty themselves? The range is massive: N, HO, O, On30, G. Buildings, controls, track, accessories. The book is 16mm thick and it's on that thin paper ModelRail uses. OK, so it's A5 in size but with 350 page, that's a lot of toy trains. Look at this. It's a Hornby Skaledale garden shed. Below it is the packing this tiny building arrives in. 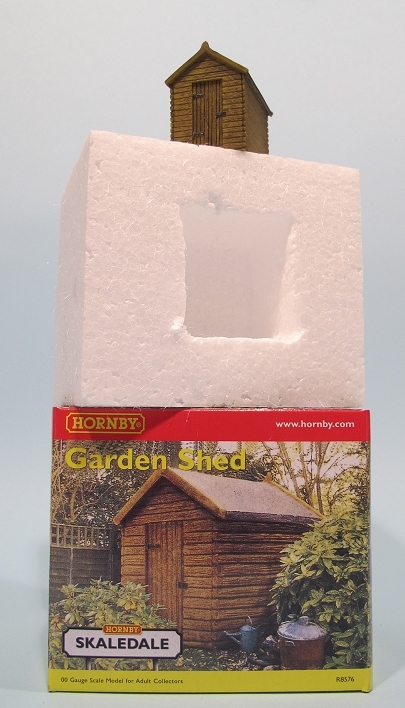 The cardboard box contains a brick of polystyrene. In this, wrapped in a plastic bag, is the shed. Now, the shed is made of resin and pretty strong. It may be hollow but there are very few small projecting bits to knock off. More to the point, when you buy a much larger building from the same range, the packing isn't commensurately larger than this. In my experience, the thickness of polystyrene isn't any greater for the larger, and presumably more fragile, model. So, is it that we modellers can't be trusted to get out purchase back home from the shop without breaking it? Maybe it's an acknowledgment that most railway modellers buy everything through the post anyway even if they have a local model shop, so the product might as well be packed to survive the efforts of the Royal Mail. Or maybe I should shut up and just accept that landfill is going to get a little fuller very soon. Go on, someone must have an idea why this is like this. At the moment I'm working hard on Modelling British Railways Diesel Locomotives as well as a slew of model making projects for magazines. Blogging therefore will be a bit lightweight for the next couple of weeks. I'll keep throwing up posts, but you'll just have to excuse me if there aren't any major, exciting projects involving soldering irons on the go at the moment. Mind you, the bookazine is looking good. First results from the designer are very nice and the collection of photos is incredible. Who knew pictures of diesels could be so good? Last Sunday, the sun eventually shone and 4 or 5 different model boat clubs joined together at the Knightcote waters and had a good sail. As you can see, there were an awful lot of boats to be seen. High point of the day had to be the procession at the end were well over 20 boats were on the water. Now, it's not a big lake but we still managed to stay on and not bump into each other very much. More photos here and here and you can visit the KMBC website too. If you like your railways grimy and industrial, then my projects in the latest Hornby Magazine will be right up your street. Over at Clayhanger Yard, I'm messing around with real ash ballast. It's messy stuff but with a bit of work, makes the layout look very different to one covered with nice, clean, granite ballast. It's not all muck and dirt though, there's a retaining wall topped with lovely greenery made from hanging basket liner. I'd not used this before but read about it often enough in the past to know it was worth a go. All it took was teasing the material out, sticking it down and covering it in flock for some lovely looking, non-descript, green stuff. Dr Phil is in the clinic explaining what all the bits of a wagon are to readers. It's easy to forget that a newbie faced with the components in a kit will wonder what on earth half of them are. V-hanger? Solebars? 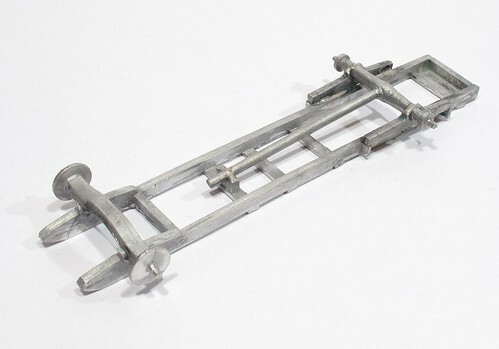 Even axleboxes can be confusing as in plastic kit terms, they arrive fitted to the W-irons and often the solebars so you could easily assume that's how they work on the real thing. Back to brickwork, I'm very pleased with the results of the build of a MiniArt Workshop kit. Everyone who has looked at the kit says, "That would make an engine shed" so I had a go at it to see if they were right. Things aren't quite as easy as you might hope. 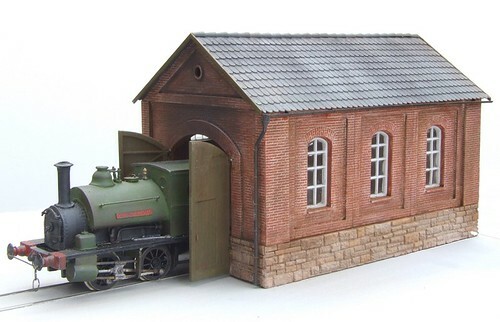 Not if you want to get a loco through the door without bashing the archway anyway, but it's simple enough not only to build as a structure, but even one with a detailed interior with a little switching around of the parts. I spotted on the Bron Hebog blog that the iconic Ffestiniog Railway engine, "Welsh Pony" is to be restored. This is great news, not just because it's another steam engine put back in working order but because it says loud and clear that everything is OK on the FR & WHR railways as far as motive power is concerned. The line has reached a level of maturity that allows it to progress "nice to have" projects instead of working hand-to-mouth to keep that trains running. 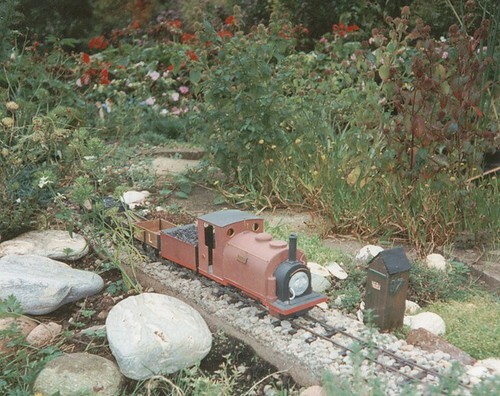 Anyway, a couple of days after I read this news, I found a photo of one of my old garden railway efforts. The loco is based on "Duke" from the Rev Awdry railway series, which in turn was based upon the George England engines. My model dates from an era when I had no cash and so needed to make everything if I wanted a model. Duke's saddle tank is an old coke can cut up. Most of the superstructure is Daler board card. Frames are 2mm thick plasticard but the wheels are cast in Isopon car repair resin. Axles are brass tube, the motor a cheapo 6v item with Proops plastic gear which could be bought in a big packet for a quid. The tender wheels are slices of plastic drainpipe. Con-rods will be lengths of copper-clad sleeper intended for building OO track, probably using Peco track pins as crank pins. Power came from a couple of D-cells in the tender. The nameplate and face can be removed, they are held on with magnets, augmented in the laters case, 3 Peco track pins. The face is Milliput by he way and could be replaced with a more realistic smokebox door. Looking at the photo, the model doesn't look too bad. Sadly, I don't recall it every working that well. Some of the materials were a bit iffy too, the tender body is that thin card you get in with a new shirt for example. Despite this, with rose tinted glasses on, I'm still quite proud of my achievement. 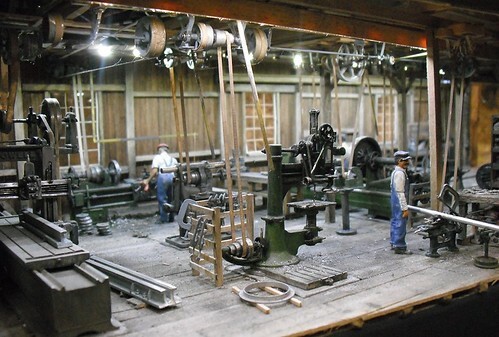 There's a lot to be said for having to be inventive in your model making and 16mm scale is good for this as even the grown-ups are heavily into bodging if they aren't proper engineers. I love an unusual use for run-of-the-mill products. My use of Johnson's Klear floor polish was behind the times but I managed so snag a bottle before it went off-sale and prices on ebay overtook the sort of champagne favoured by premiership footballers. Well, for those who don't realise that Humbrol spotted the gap in the market and plugged it with their own version anyway. Anyway, I was reading MRJ 222 and spot that one of the layout builder has used something called Astonish Flawless Wood Floor Polish. I thought this sounded interesting so kept a look out for it. None of the local supermarkets or hardware stores kept the stuff. Anyway, I tried a few drops of the contents on some sand. It might have cleaned it, it certainly didn't stick it together. So, it's back to the shopping for me. I just need to keep a look out for this stuff. Names evocative of the lost era of train travel. Days when jumping on a train and travelling from one end of the country to another was an occasion. The sort of trip you dressed for and I don't mean in sweat pants and a singlet! At first sight, you might think this is a coffee table book for those who like looking at pictures of trains, but you'd be wrong. 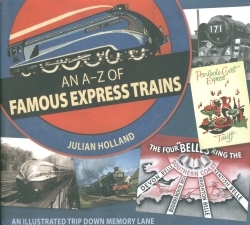 Julian Holland explores 95 different named express trains from the UK. I didn't know there were that many for a start and I doubt that many enthusiasts could come up with as comprehensive a list as this without serious research. Each express is pictured, often several times, along with a brief history of the service. In addition, advertising material, timetables and even menu cards are reproduced. It's this that lifts the book from just another volume for enthusiasts to perv over the details of a particular engine to being enjoyable to a wider audience. You don't have to be particularly in to trains to appreciate the marketing material design for example. Of course if you are an enthusiast, the book will not only suggest services that you might wish to include on a model railway, it will lead you toward the dangerous land that us collecting memorabilia. After all, if you are going to run the Golden Hind (London Paddington to Plymouth) then who wouldn't wish to own a leaflet with a fabulous stylised Western Diesel on the cover? The book is very comprehensive and it's difficult to pick a highpoint from among the offerings. I will have to give the author top marks for including the Condor service - Britain's first express container service (the name comes from "container door-to-door"). I suspect the validity of its inclusion will keep enthusiasts arguing for hours! Illustrated profusely throughout, the production and printing quality is very high. The printing on reproduced advertising material is perfectly readable and the photos, both monochrome and colour, as clear the originals will allow. Last week I posted about crushing coal and in response Tony Cockrell said, "Could we see the finished coal heap please? " Well, here it is. Not very exciting but it will do the job. My prototype is from Hellingly Hospital where all the photos show a massive pile of coal with no containing bunker. It's all pervasive too as the mound apparently existed fro half a century as far as I can tell. Assuming that the coal will be transferred to the next-door boiler house manually, I've modelled it with an indentation where it's been dug and barrowed away so in plan the pile is sort of heart-shaped (Fred is standing in the dent) and there's a load of much (Humbrol Smoke weathering powder) showing where the barrows have been. Interesting side point. The photo shows the limitations of cutting out the background and wanging in some sky. From this angle, the roof lines should be visible but of course these are flat building ends. In real life, it isn't nearly so apparent. Anyway, more on this end of Clayhanger in a future edition of Hornby Magazine. Is this B1 too cute to cut up? I'm on the lookout for a chassis suitable for a narrow gauge project. One of the options I've been offered is a Graham Farish B1 - Springbok. I'm pleased to say that it looks like there is a better option and I won't been needing to use this little engine for parts. I know this sounds stupid, it is just a toy train after all, but it's such a nice model that I don't want to damage it. Over the last few years, the quality of N gauge has come on in leaps and bounds. Springbok is finer detailed than engines in 4mm were 15 years ago and even better than O gauge engines 40 years ago. Separate wire handrails, fine waggly bits, wheels that wouldn't cut through the topping on a pizza never mind the base. If it wasn't for that pug ugly coupling sticking out the front, you could believe you were looking at model in a larger scale. If I want to improve things even further, a set of scale bogie wheels are in the packing although the instructions say they aren't suitable for running on a layout. Anyway, my search for a donor model continues. I think I have a better option that I can't get so worked up about. I just don't want to give the B1 back. I don't often do politics on this blog, but today I'm making an exception. It seems that there is a bit of a hole in the funding of the Science Museum in London. Thanks to government cuts, there is a 10% gap in funding and according the BBC, the Director Ian Blatchford has suggested that this could be fixed by closing one of the northern museums in the group. That means either the Museum of Science & Industry in Manchester, National Media Museum in Bradford or National Railway Museum in York. Obviously, every city potentially affected is up in arms. Access to the museums is free at present, apparently this is partly the cause of the problem. It seems that we can't afford free access to museums in these straightened times. What we can afford is to feed out MPs in the cheap. Rib-eye steak with hand-cut chips and Béarnaise sauce in the Palace of Westminster - £2. In other words we subsidise MPs (Salary £60K plus expenses plus any other side-lines) by £5.93 every time they sit down to eat a steak lunch. On the other hand, if they prefer Haddock and leek fish cake with tomato and dill cream, we chip in £5.13. Personally, I like a nice desert to finish off a meal so what about Chocolate and orange torte, coming in at under a quid thanks to our generous help with £1.56. Oh, and don't worry, the drinks are as subsidised as the meals. So, basically, we have a group of people earning over twice the average salary in the UK and they are under the impression that feeding themselves cheaply (cost £8,823 per MP and Peer) is a better idea than allowing everyone else to see, and be inspired, by engineering excellence. Personally, and this is my blog, I think they are wrong. The country is in a financial mess but what will get us out of it is people developing and making things. Adding extra inches to Eric Pickles or John Prescott's waistlines isn't going to help anyone unless the new pairs of trousers they buy to deal with this are phenomenally expensive. Now, I can see that this campaign is partly scaremongering. Ian Blatchford sees cuts in his budget and threatens to kill off something people care about. There are other options to solve the problem, re-introduce admission charges for example. I know it's not nice and personally I'd hate to see this happen, but if you have to pay, at least there is something to pay for. I also note that he is suggesting closing a northern museum. That's a dangerous move as none of our political masters gives a toss about anything outside the M25 and so would probably be quite happy to see all three venues shut down. Hopefully this is just scaremongering then, but just in case, can I direct you over to the York Press "Save the NRM" petition. Signing it will make a point, even if it's one that will probably be ignored. More practically, an e-mail to your local MP will also register your unhappiness with the situation. You can find their contact details on the TheyWorkForYou website. If you are thinking, "Well that won't do any good. ", you're probably right, but not writing to your MP definitely won't. Oh, and bear one thing in mind. The NRM have a hostage. It's got 4472 on the cabside. I would hope that there are photos being taken as we speak with men wielding cutting torches next to the Flying Scotsman. People get funny about certain steam engines. They raised the money to restore it - how much of a fuss can you generate by threatening to scrap it and so George Osbourn can have a nice, cheap, lunch. Last Saturday was the annual AGM for the Double O Gauge Association. As usual, it was a fairly laid-back event with a short session of proper "business" and lots of looking at model railways. My role, as usual was to run the modelling competition. The number of entries was up on last year and there were some absolute belters. I didn't think it would be possible to fit inside working valve gear in a OO loco. Surely the frames are too narrow? Surely OO modellers are too pragmatic to fit waggly bits you can't see into their engines? 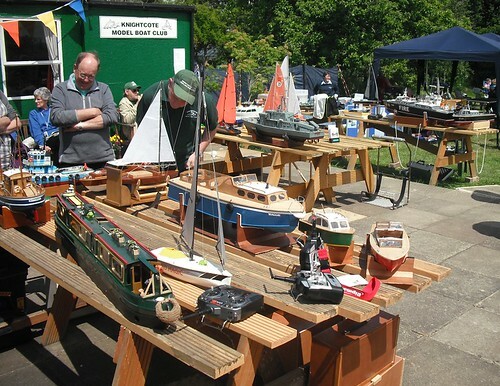 While railway modelling isn't really a competitive activity, the competition does encourage people to bring models along so there is something for attendees to look at. Judging is by votes cast by those present which makes it nice and democratic and means everyone gets to take part. It also gives me something to do while the meeting is on as we like to finish the AOB section with competition results so I'm sitting there totting up the votes while everyone else rattles on about things. I finally emptied the bottle! I have done something I've never done before. 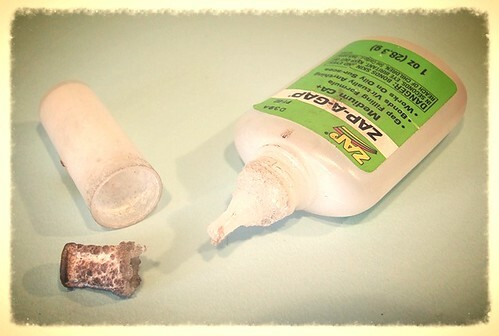 I emptied a bottle of Zap-a-Gap superglue! OK, this might not sound that impressive. On the other had this is the Internet, a place where cats falling over is enough to disrupt an office, so my achievement is relative. 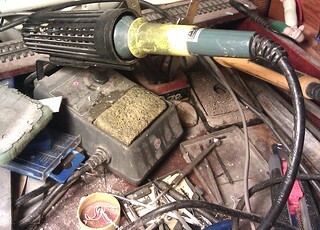 Anyway, normally the level of Zap reaches about 4mm from the bottom when it becomes a bit gloopy and then hardens. I don't mind, that represents many months happy model making so it's not a huge chunk of my budget to buy a couple of bottles a year. To empty a bottle, either I've looked after it well (I haven't, it lives on a shelf with indirect sunlight), the formula has changed (don't think so) or I've just used a lot more this year. That might be the case - it is my fixative of choice - but I can't see it. Maybe I've just been lucky. One thing I do do is clean out the top for the bottle so it's a reasonable fit. Glue gradually builds up inside it but if you screw a bradawl in there, the gluey plug can be pulled out. Cleverly the gunge doesn't stick to the inside of the top so while the outside looks horrible, the inside is clean as a whistle. Anyway, if someone can just tell me where I put the spare bottle I bought a few months ago, I'll get back to work. Clayhanger Yard is in need of a coal pile. 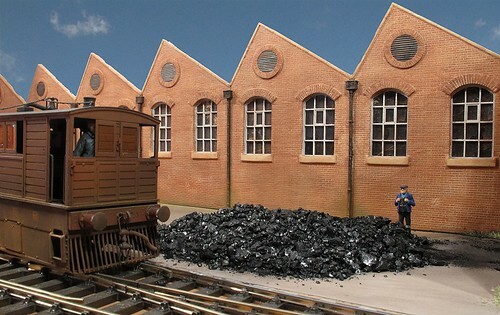 Thanks to some excellent planning on my part, I have a bag of Welsh steam coal in the shed. The mice had a nibble but it seems that nutty slack isn't to their taste. Of course, those owners of miniature chuff chuffs want modest sized lumps to feed the fire. Certainly not the near dust-like sizes we need to modelling purposes. Traditionally, when talking about breaking up coal, the writer will mention whacking the stuff with a big hammer. While this is very macho (we are talking toy trains here) and satisfying in a way, it's hopeless unless you enjoy spraying lumps of the black stuff around the garden. Or kitchen if you are brave/stupid enough to try it in there. 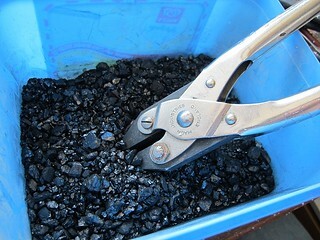 Occasionally, mention is made of putting the coal in a plastic bag first to restrain the shards. This doesn't work either as the coal and hammer conspire to make holes in the bag, which allows the mess to escape. Another suggestion was a tea towel. Well, the coal is less likely to punch holes in this but it's going to do no favours for your drying up. Crush the lumps in the jaws of a pair of pliers. The gentle action, combined in this case with soft coal, makes it possible to reduce the lump size with surprising accuracy. Working in an old ice cream tub, the stuff just drops back in and there is no mess. You don't need special pliers either. I grabbed the first handy pair which happened to be a parallel jaw set but normal ones bought for about 2 quid on a market will be just as good. Part Two of Geoff Holt's magnum opus - I looked at Part One back in February. Sadly, Geoff passed away just as this volume was going to print so these books, and many breathtaking models, remain testament to his modelling career. Sales for the first part were apparently higher than expected and I suspect that this will be repeated for this book as well. In many ways for the practical modeller, I'd suggest that it is an even more essential purchase than the first one. Here, we get to look at the nitty-gritty of locomotive bodies. Starting off with the running plate, valances and splashers, we move on to boilers, cabs, fittings, tenders and traction supply. Testing and painting complete the model. We finish with words on the basic lathe and its operation. 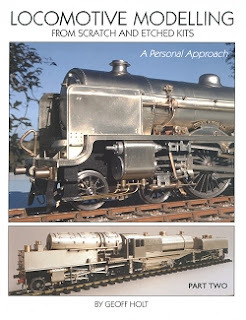 Each chapter looks at real engines and then talks about Geoff's methods for modelling them. 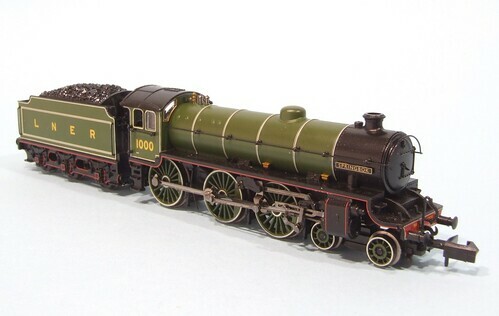 Extra illustration is provided by the running builds of an engine using a kit and scratchbuilding. By the end of the book you see both models beside each other and I certainly can't tell the difference. Mind you, I'd be happy to have produced a model of this quality with the aid of a kit, never mind cutting out all the parts myself. A very practical book and probably worth its price just for the demonstration of how to make a boiler handrail that flows around the front of an engine without all the prodding, poking and re-bending that always accompanies my efforts. 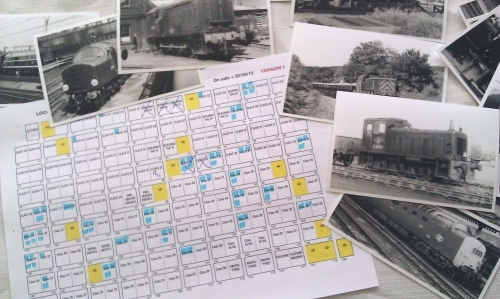 One surprise was the inclusion of radio control for locomotives in the text. Sitting among some very tradition techniques, I wondered how it fitted in but reading the information, it makes perfect sense and shows that Geoff wasn't averse to looking at newer methods if required - which probably means that if it's in the book, it's the best way he found to do something! I love tools. Can't get enough of buying the things. Never feel that money spent of equipment is wasted. Which is probably why the cupboard of kits is also a cupboard of tools. Not all are useful. Even those that are have to overcome my inertia to get them out and set them up first. 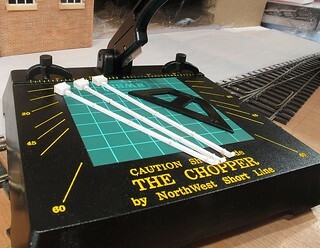 One of the latest additions to the workbench is this The Chopper II from American firm Northwest Short Line and sold in the UK by NG Trains. MKII is a different beast. Cast metal means a descent weight and the blade is spot on accurate. Metal guides can be clamped in place for accurate and repeatable angle cutting. The job I've just used it for is making square section drain pipes for a factory. Being able to chop the strip with nice accurate, square ends is fab. No more bodgery to keep things square which speeds up construction AND improves the results. £42 might seem a luxury but for me it's hopefully going to be worth it. If you stopped by for a read on Friday, you'll have seen Chris Nevard's excellent photos of my Garratt loco on his layout. I took the loco for a day out at Railex and handed it over with the H Class first thing in the morning. Chris and his lackey Graham, seemed impressed and the big engine quickly usurped the J94 on the mine side of the layout. To be honest, the poor chap was reduced to running Great Western locomotives, so leapt at the chance of something descent. Now, I know the Garratt can be a cantankerous beast. Those gearboxes need to be warmed up every so often or they don't run smoothly. The Hellingly Hospital engines all need a good thrash before the 108:1 gears start to behave. With this in mind, the day before, I ran the engine up and down my test track for a few minutes. I only have three axles-worth of rolling road or it would have stretched its legs on there. All seemed well so the model was wrapped up in bubbles and stuck in a box for transit. Needless to say, once on the track, the front power unit would run backwards as well as ever. Forwards only happened in a series of jerks. The back unit performed as well as you could hope which somehow made it worse. Anyway, the engine posed for pretty pictures but didn't get the chance to earn it's keep as I'd hoped. I still don't know why it mis-behaves either. Probably just thrown a huff. This post was going to be about how all this modelling isn't quite as much fun as you might expect. 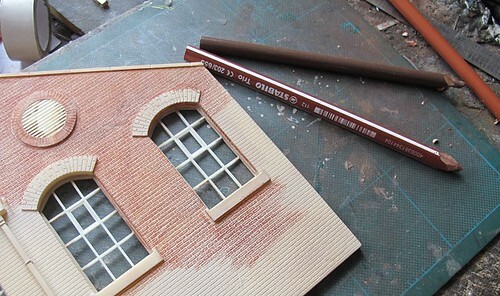 I'd be going on about how I wasn't enjoying colouring in the brickwork on 2 and a half feet of O gauge factory building. But it's not. It's the exact opposite. You see, I've been reading the excellent "Golden Handcuffs" by Polly Courtney. The book is a fictional tale of a woman entering the world of corporate finance. She quickly discovers that the job takes over her life with stupid hours of work. The biggest complaint seems to be the mind numbing nature of the job which seems to involve fiddling with spreadsheets and presentations. All while being paid a shed load of money and trapped by a "golden handcuff" payment received on joining the firm that has to be repaid if the recipient leaves before the end of their first year. Now, this IS a good read and I'll be honest and admit that despite the sound of unrivaled riches, working in corporate finance all seems a bit rubbish to me. But, I don't care about the job not stretching the employee. Tough. There are plenty of people who work dull jobs for far less money. The worst job I ever had involved sitting in front of a video showing traffic on a junction and counting the different types of vehicles that crossed the line. It was as mind-numbing as it sounds. The film had to be watched at 3 times normal speed and counting took place on mechanical clicker things mounted on a board. I lasted 3 days and never, ever, want to go back. Some people loved it. There were people who had been with the firm for years. Even at minimum wage they were happy. So, when I find myself looking at a dull task like brick colouring, I remember this job. I realise that having turned modelmaking writing into (sort of) a full time job, I get to (sort of) work my own hours, do something I enjoy and listen to the radio station I like. Into everyone's life, a little rain must fall. Even being a stuntman, my marker for an exciting job, must have dull days. Every job I've ever had involves varying amounts of rubbish so this ones not that much different and if the worst I have to worry about (apart from getting paid, the eternal moan for freelances) is a few dull hours with pencil crayons, then I suppose I'm doing all right. Which is the best anyone can hope for really. No cake. That's what I remember from Railex 2013. Others might say it was a terrific show but what I can tell you is that there was no cake available. Worse, the good folks behind the 3mm scale layout Hemlock taunted me with exhibitors cake. 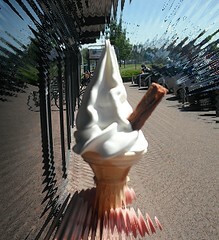 Never mind, it was a terrific show and since the weather outside was sunny I was at least able to take advantage of the ice cream van in the car park. In the hall, the layouts were terrific. I'd gone with a great big shopping list (mostly fulfilled) and just as long a list of people to chat to (again, mostly done). 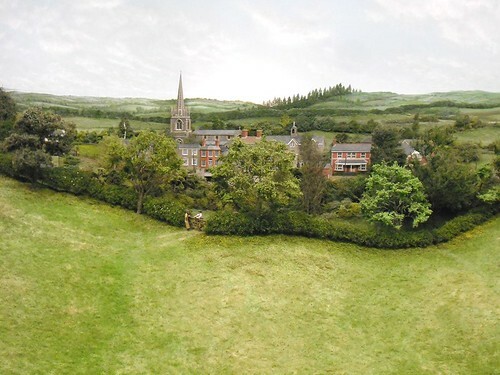 For many the star was a 7mm scale layout called "Bucks Hill". It was a most impressive piece of work - simply erecting the model at the show apparently took 8 hours! The backscene is a masterpiece, not just of superb painting but rarely seen perspective modelling. Instead of a simple flat background, the artist responsible added 3D elements both fully and relief modelled. Sadly, technical problems seemed to plague the model every time I visited so I didn't see much run. Such was the quality of display, this didn't seem to matter to the punters and there was always a huge crowd around it. I think that tells you just how good a model it is. As far as I know, this is to be its one and only appearance at a show - pity as there are a lot of people who would like to see it. Another layout that appealed was the On30 Mumby Lumber Co. While a very simple layout, at each end there are the most fantastically detailed workshops for the audience to peer in to. On the track, logging trains are cleverly unloaded into the river - or at least into a hole in the river! You've already seen over the last couple of days Polbrooke Gurney, a little layout I helped out with some rolling stock. Regular coverage on the web and in ModelRail ensured that despite being tiny, the audience didn't overlook it. In fact, I think knowing how much of the modelling has been done made it even more appealing to people who wanted to see how close it was to the photographs they had already seen. Needless to say, there are obviously not enough pictures as the visitors took the time to snap a few more. Anyway, enough talk, the photos are here. Enjoy!